An internationally renowned centre of clinical excellence at Cambridge University Hospitals has today (18 October) officially opened a high-tech facility which will double the number of patients it can treat. 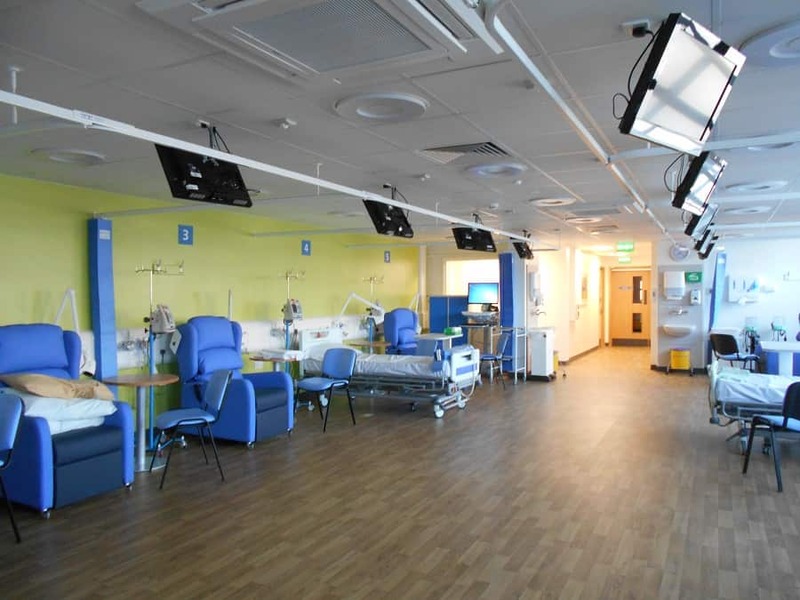 The Haematology Day Unit has moved from cramped premises on the tenth floor of Addenbrooke’s Hospital into a £1.5m state-of-the art ground floor facility opposite the main entrance. The unit was opened with the help of Addenbrooke’s Charitable Trust (ACT) and the honour of unveiling the plaque went to loyal supporters, patient Mervyn Martin, 67, from Barton, and Hazel Mack,65 from Saffron Walden, who lost husband, Brian, to cancer on 14 February this year. The Haematology Department provides a comprehensive range of in and out-patient services for the diagnosis and management of patients with all types of blood disorders, including cancers of the blood. The day unit, which will see around 7,000 patients a year, has 23 treatment spaces, consisting of two large treatment areas, four side rooms for better management of infections, and video conferencing facilities for time-saving virtual meetings between clinicians. Patients will find a bright new reception and waiting area, a quiet room, comfortable new furniture, relaxing artwork, television and headphone facilities, and a tranquil outside space. For the first time the department has a dedicated platelet agitator, which assists with transfusions and will prevent delays, by saving nurses a trip to the main blood bank department to use equipment there. The Apheresis Department has moved to the old day unit which in turn has allowed for the expansion of the Cancer Assessment Unit. The Apheresis service undertakes complex procedures on patients, all of which involve separating whole blood into components like plasma, granulocytes or red cells. Crucially, there is specialist new equipment for the Apheresis Service to meet increasing demand for treatment of patients with Leukaemia and blood related disorders. A second Extra Corporeal Photopheresis (‘ECP’) machine will treat painful side effects caused by bone marrow transplants and reduce the risk of infections. It will save some patients a gruelling 50 mile drive to London or 90 miles to Nottingham. A fourth blood cell separator will enable more patients to be treated for red cell and plasma exchange procedures as outpatients. Mervyn, who is in remission from a type of bone cancer called multiple myeloma, is so grateful for his treatment his company, St Andrew’s College Cambridge and Select English, donated £50,000. Donations for the unit are still welcome. Visit www.act4addenbrookes.org.uk/bloodcancer for more information.